We have whipped to perfection sweet juicy strawberries to bring you this spring time treat. Dairy free • Gluten free • Fat free • Vegan. We have combined organic milk & sugar with fresh Gippsland cream and raspberries to bring you a heavenly treat. It’s so good, it was judged Gold Medal Winner at the Royal Melbourne Fine Foods Awards. Featured as ‘Flavour of The Month’ it’s available at all Fritz stores this May. Grab a cup, cone or take home pack and savour the moment. Refreshing, light, fruity and sweet. Made with freshly chopped watermelon for the local market. 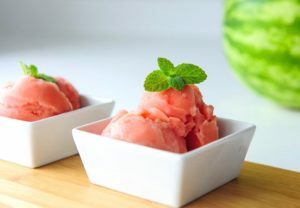 We love this gluten free and vegan Summer treat. Flavour of the Month this February. Originally from Sicily, they’re juicy, sweet & a little tart. This dairy & gluten free sorbet is surprisingly popular with children, both big and small. Fritz Gelato’s sorbets are made with fresh fruit using traditional Italian methods and suitable for Vegans. The summer festival season continues with World Vegan Day. Enjoy all your favourite Fritz flavours at the festival, including Raspberry Rumble, Strawberry Bliss, Zesty Lemon, Pineapple Smash, Passionfruit Kick, Blood Orange, Mango Tango and of course, Bounty. The Royal Melbourne Show has begun and we have a new location this year.